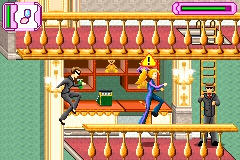 GBA Secret Agent Barbie: Royal Jewels Mission (USA) in 13:41.68 by AIVV73. The famous doll is a secret agent tasked with recovering the Queen's Jewels. This involves international travel, vehicle chases, and computer hacking that one expects from secret agents. Barbie mostly shuns stealth, however, instead opting to just run and jump past enemies and get the job done quickly.